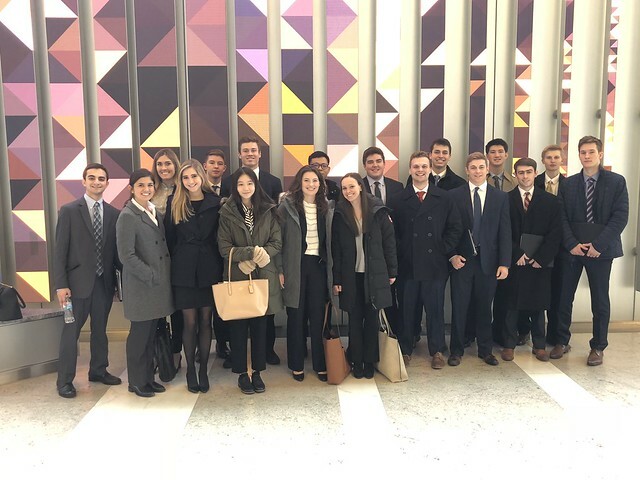 This January, the Wall Street Club of Notre Dame hosted four career treks in three cities: New York, Chicago, and San Francisco. Each trip consisted of approximately 20 students who were selected for the treks through a competitive application process led by the Wall Street Club. In these cities, students met with Notre Dame alumni from multiple financial firms. They were given the opportunity to network, practice interview skills, and garner practical financial knowledge and apply it outside of the classroom, expanding on necessary skills in the investment industry. These career treks also allow students to gain direct insight to a firm’s culture. Firms may have markedly different environments from one another. A large, bulge bracket bank for example, will have a culture far different from that of a boutique bank. Through in-office, personal interaction with banks of a number of sizes, students are able to picture themselves at each individual firm and decide which may suit them best in the future. Notre Dame career exploration treks enable students to make valuable connections and learn interview and networking skills in the process. They also provide students with key industry knowledge, equipping them with the tools necessary to succeed in the industry and discern their potential future in finance and investing.